Director Rahul Sankrityan's Taxiwala (Taxiwaala) featuring Vijay Deverakonda, Priyanka Jawalkar and Malavika Nair in the leads, has received good reviews and ratings from the film critics. 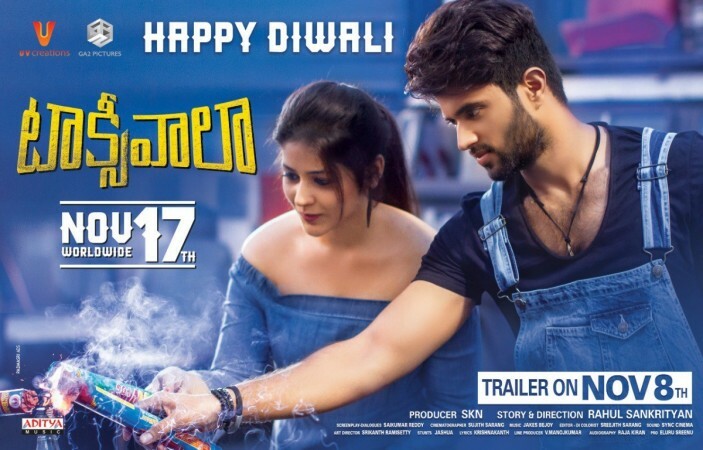 Film critics say that Taxiwala has an interesting concept and Rahul Sankrityan has made it a delicious cocktail of wry humour and paranormal activities, but trimming of the second half could have made it even better viewing experience. Taxiwala is a supernatural comedy thriller film that is about guy named Siva (Vijay Devarakonda), who is a graduate. He buys a vintage Contessa car for a cheap price and becomes an app based taxi driver. Soon he realises that there is a spirit in the car and it is taking control of the car. What happens next forms the crux of the story. Taxiwala has a unique theme that has never been explored in Tollywood before. The movie is full of thrills and comedy sequences. The first half is very engaging and entertaining, but the second half suffers from slow and dragging narration. Some portions could have been trimmed to make it crispy, say the critics. Vijay Devarakonda has once again delivered fantastic performance, which is the biggest attraction of Taxiwala. Other actors have also done good jobs. The movie has decent production values and background score, picturisation, VFX works are the attractions on the technical front, add the critics, who have rated it an average of 3 out 5 ratings. It has got different yet engaging concept. Car acting weird is a concept that is never touched on Telugu screen as the main plotpoint (last such scene I remember in Telugu films was the cellar scene in second half of Arundhati where a car tries to jump ahead on it's own to scare the villain, Another one is hero hacking car's security system in climax of Lover film). Plus points of the film are concept, execution and Vijay Deverakonda. On the flipside, narration in second half slows down considerably. On a whole. Taxiwaala is a decent content film and you may watch it! Taxiwaala is an engaging horror comedy which has a good premise. Interesting concept, good comedy, and decent thrills are basic assets of this film. However, things get a bit slow in the second half as the proceedings become quite serious. As there are no major releases till this month end and keeping Vijay's popularity in mind, this film has a good chance to work at the box office. All you need to do is to watch it with low expectations as the film will not disappoint you and ends as a breezy watch this weekend. Taxiwaala works in parts, largely thanks to a wonderful performance from Vijay Deverakonda, but the film veers away from Vijay and his character in the second half, tying itself up in knots. A weak climax and patchy narration derails an otherwise entertaining fare. Taxiwaala is engaging for most part. Full credit to Rahul Sankrityan for keeping it fun and simple. The narrative runs out of gas towards the end and the ride turns bumpy, leaving you with an impression that the writer has run out of ideas. Thankfully, there is a beautiful epilogue which will leave you with a smile in the end. Anything to do with paranormal powers is a tricky zone to tread on. It can come off as gimmicky or silly if not handled well. Sankrityan pulls it off quite well for the most part, though these episodes get prolonged. Some tightening and holding on to the smartness of the initial portions could have helped this film from getting tiresome.